Green tea has been around a very long time. It’s been used by the ancient Chinese for many medicinal purposes for about 4,000 years. It’s been used in their culture for just about everything. Modern-day scientists have studied green tea and reported a possible linkage with the reduction of chances for people to contract some types of cancers, along with positive effects on our bodies like increasing our energy levels. Green tea has been linked to helping eliminate our chances of contracting other diseases as well, such as cardiovascular disease and arthritis – and it can even help lower our cholesterol levels. Using green tea can help with our minor aches and pains like headaches and joint pain. Green tea contains catechin polyphenols, which are believed to be the ingredients that give us all of these wondrous health benefits. The polyphenols are found in the leaves of the camellia sinensis plant, which is then ground up and made into our green tea. These polyphenols are thought to inhibit the cancer cells from growing to form the many types of cancer we see today, without damaging any tissues in the process. Polyphenols are considered to be very powerful anti-oxidants, which promote healthier body processes. It’s also known for helping some people lose weight, by increasing your energy levels and promoting a healthier rate of calorie burning within your body. It’s an all-natural answer to your diet program without the side effects of controversial supplemental diet pills. Drinking green tea is a natural, safe way to provide these health benefits, but it’s not a replacement for regular health checkups with your doctor. Continue to see your doctors, but give your body a little added benefit of a healthy lifestyle in addition to your checkups. It may be linked to providing natural treatments for some ailments and lessens the chance for others, but don’t forego your physicians’ prescribed treatment plan. It may lessen your chances for diseases, but it’s not a miracle cure for everything. Use it to enhance your treatment plans. 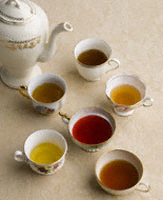 Green tea can also provide you with a healthier oral hygiene regimen. It helps prevent plaque from forming, while keeping bacteria under control so it doesn’t get out of hand and cause halitosis problems. With all of the reports of harmful effects that some treatments cause, green tea is an attractive option. The only harmful effect it can cause is from the caffeine you consume with it, but if you choose a decaffeinated version, the effects are minimized. If you want to keep your body truly healthy, give green tea a try. The ancient Chinese did – and they used it for almost all of their medicinal needs.